On the 13th May 1914 trainer Atty Persse made the sad announcement that The Tetrarch would be scratched from the Derby. The unbeaten colt, who had already missed the 2000 Guineas, would never run again. At the time, the celebrated colt was considered by many fine judges to have been the fastest horse ever seen on the Turf. Such a statement is of course impossible to substantiate but what is certain is that The Tetrarch was unquestionably one of the most remarkable racehorses of all time. 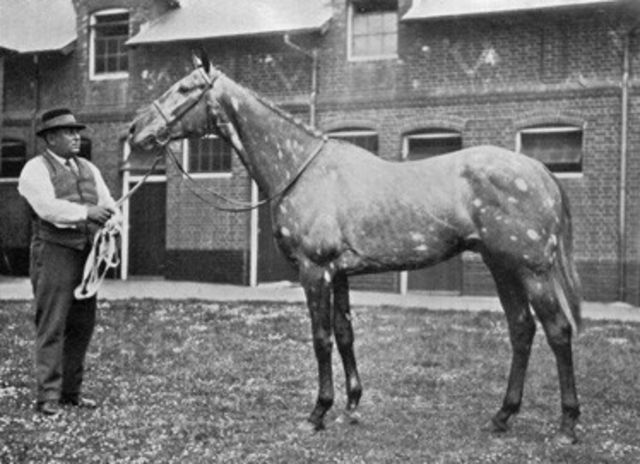 The Tetrarch was foaled in Ireland in 1911. He was by Roi Herode out of Vahren, by Bona Vista (also the sire of that great stallion Cyllene). His breeder Edward Kennedy was attempting to revive the famous Herod male line and had therefore purchased his descendent, the grey Roi Herode. A good stayer, Roi Herode had finished unplaced in the 1907 St Leger and later finished second in the Doncaster Cup as a five-year-old. Having broken down preparing for the Chester Cup the following year, Roi Herode was sent immediately to stud where he was bred to just a small number of mares, it being so late in the breeding season. One of the few was Vahren, also owned by Kennedy, for whom she had won a couple of minor races. The rather fortuitous result of this chance mating would be The Tetrarch. At birth The Tetrarch was a chestnut with black patches but he would later become grey with the patches turning white. This distinctive appearance led to him being initially known as ‘The Rocking Horse’ but later, as he became more successful, he was nicknamed ‘The Spotted Wonder’. His unusual appearance also seemed to put many prospective buyers off at the Doncaster yearling sales in 1912; a few even suggested that he should be gelded and saved for a career as a chaser. Atty Persse though saw something in the funny-looking colt and purchased him for 1,300 guineas. At his new home The Tetrarch soon showed his exceptional ability in a series of astonishing gallops with both other good two-year-olds and older horses. Unsurprisingly, given his outstanding work, he was an absolute certainty for his first maiden race at Newmarket in April 1913, winning effortlessly by 4 lengths at the very generous odds of 5/1. He then won the 6f Woodcote Stakes at Epsom in a canter followed by a ten length victory in the Coventry Stakes; it was said that he was almost back in the winner’s enclosure at Royal Ascot as the others were pulling up. The only time he was almost beaten was in his next race at Sandown. Having completely messed up the start of the valuable National Breeders Produce Stakes, The Tetrarch looked in a hopeless position at halfway but his jockey Steve Donoghue, who rode him in all of his races, got him balanced and running and he just got up at the post to win by a neck. His next race was probably his most impressive. He won the 6f Rous Memorial Stakes at Goodwood, conceding 13lb to the future 1000 Guineas and Oaks winner Princess Dorrie and beating her by an easy six lengths. Two more facile victories followed, including the Champagne Stakes at Doncaster. But soon after this last race he rapped his off-fore fetlock in a routine gallop at home and was therefore put away for the season. Having won all his seven races as a two-year-old, nearly all with consummate ease, The Tetrarch topped the 1913 Free Handicap a massive 10lbs clear of the rest. He was a strong winter favourite for both the 2000 Guineas and the Derby. But sadly that was it for The Tetrarch. In the spring of 1914 there was a recurrence of the same injury and the colt was unable to run in the 2000 Guineas. His vastly inferior stablemate Land Of Song finished a close up fourth in the race, and thus it was widely assumed that The Tetrarch would have won relatively easily if he had run in the classic. And then, having resumed training and with an eye on Epsom, The Tetrarch once again injured the same off-fore leg. The resulting lameness meant that there was no hope of him ever running again, he was taken out of the Derby and promptly retired to stud. We will never know whether The Tetrarch would have stayed the Derby distance. His phenomenal speed and front-running style of racing raised considerable doubts and certainly his jockey Steve Donoghue thought it unlikely. Atty Persse thought otherwise and would not consider the possibility of the horse being beaten over the Derby distance, nor indeed over any other distance for that matter. On breeding he should have stayed but the horse was a conundrum in that his pedigree suggested stamina yet he showed such unbelievable pace on the racecourse. At Ballylinch Stud in Ireland The Tetrarch proved to be a most reluctant stallion who showed very little interest in covering mares. In fact he could only muster 130 foals over a ten year period before becoming completely infertile. Despite this low number he did prove to be an outstanding sire and 80 of those offspring went on to win races including four classic winners. The Tetrarch was Champion Sire in 1919. Three of his classic winners won the St Leger, which only further convinced his admirers that The Tetrarch would indeed have won the Derby given the chance. His best son was Tetratema, who almost proved to be as great a racehorse as his sire with a similar unbeaten two-year-old campaign followed by victory in the 1920 2000 Guineas. Having failed to stay in the Derby, Tetratema became a champion sprinter and is generally considered to be one of the greatest sprinters of the twentieth century. He too later became Champion Sire in 1929. Tetratema was undoubtedly a champion but sadly that important male Herod line did not endure through him or his sons. Instead The Tetrarch is best remembered through another speedy youngster in Mumtaz Mahal, known as ‘the Flying Filly’. She too would have a brilliant two-year-old season, this time followed by a close defeat in the 1000 Guineas of 1924. A subsequent six length win in the Nunthorpe Stakes confirmed her as champion sprinter that year and to this day she is still remembered as one of the fastest fillies ever seen on the English Turf. At stud she has proved to be immensely influential particularly through her daughters; Mumtaz Mahal is the granddam of both Nasrullah and Mahmoud along with Abernant, the greatest sprinter of all-time. Nasrullah would be champion sire in both Great Britain and North America. His sons such as Nashua, Bold Ruler (sire of Secretariat) and Never Bend (sire of Mill Reef) have had a profound impact on the thoroughbred ever since and Nasrullah is considered to be one of the most important stallion ever imported into America. The 1936 Derby winner Mahmoud was also sold to stand at stud the United States where he would be Champion Sire in 1946. He would be a very influential broodmare sire, most notably with Almahmoud, granddam of Northern Dancer. Finally, another descendent of ‘the Flying Filly’ deserves a mention. Her great great granddaughter Petite Etoile proved to be an outstanding classic winning filly, and through her the 2008 Arc winner Zarkava can be traced all the way back to Mumtaz Mahal in the direct female line. So The Tetrarch proved to be a wonderful champion both on the racecourse and at stud. He will be remembered for what he achieved as a juvenile and for what he might have gone on to accomplish at three in 1914. And although the lamps would soon be going out all over Europe, the story of The Tetrarch, the greatest two-year-old that there ever was, continues to burn bright in the memory of Turf aficionados to this day.